Daily. I’d love to say every moment of every single day, but I’m human…so let’s just say–I seek Him a LOT. My life verse…my prayer. The plea of my holistic journey with God. The pursuit of holiness. The living out of God’s will on my life. Yesterday I did a thing, and it was amazing. As my wave hit the water waiting for the gun, one of the few songs “kick my rear into gear” songs came on the speakers and we were off. I think I swallowed half the lake, but my swim time came out 0:01/100yd more than my most recent 800m TT (yeah, I love mixing imperial and metric too…eye roll). This was a shock as I came out of the water and caught glance at my watch–we estimated my OWS pace at 0:30/100yd over my TT pace. Other than speedier than expected and oh my rocky beach, I absolutely need to upgrade to RX googles–I may be able to see in a pool and kinda-sorta sight buoys with standard goggles, but I’m going to be a danger to myself in the long term. I can’t see squat. I have the info on how to get them reasonably priced…now that I have an updated lens RX, now’s the time. I felt like I spent way too much time in the water trying to focus my eyes and process on where the buoys were to sight and make sure I was swimming in a (remotely) straight line. If you wanted a glimpse of a few of my wilder nights in college, T1 was where it was at! The speedy swim did a number on me and it took a few minutes and a lot of stumbling over myself to get it together. I did take my time, finally just sat on the ground, and got myself together. Hilarity ensued–not in the moment, but after I settled in on the bike I had a pretty good laugh at myself. Who puts bike in/bike out on a hill?! I thought I had gathered myself together, but the first minutes on the bike were sheer torture climbing up a hill to get from the beach out to the road. I didn’t even make it to the road before I had to pull over and get my wits about me. I took a minute or so to take a deep breath, pull my HR down quickly, get my head back to where it needed to be, and employ a few other attack tactics in my mental arsenal. Got moving and hit the road–and then it was game on. The bike course was essentially a few climbs of varying degree, so some work and then some reward. Once I settled in after that first stop, it was exactly what I needed–I was full-on focused. Shocked me, but bike ended up being my strongest leg of the day. I would love to improve my speed on the climbs, but I was consistent–and I even overtook several people. There was one point on a downhill on the return that I must have had a look of just sheer exhilaration on my face because I had like three racers in the other direction yell out that they loved my smile as I flew past them while they were climbing. Had one guy biff it in front of me near the aid station, but I (nicely) called out in advance of it since there weren’t many riders near me for the volunteers to not to step out to hand me anything that I couldn’t grab it. Floated my foot well in advance of bike dismount because it was on a downhill and stopping fast–no crashing being clipped in. Nailed the estimated bike time on the head. It felt amazing. Success!!! Nothing special. Wish I would’ve remembered to grab my chapstick out of my bike bag or put a second one in my running handheld. …otherwise known as a stroll in the rocks with 2 miles-ish of actual running. Due to my disdain for it and severe lack of coordination, I simply don’t have a lot of experience running off-road. Add in a gut full of lake water sloshing around my stomach and a rocky “path”….yeah. It wasn’t pleasant. I attempted to recover a bit of time on the small section of paved road we got to run on, and the downhill section that was a bit less rocky where I wasn’t as conscious of every single step, but again–that gut full of lake water. I tried to focus on the scenery around me as it was really the first time that day I actually got the take in the beauty of Lake Mead and the area and just keep moving quickly. It wasn’t awful, but it wasn’t great either. Run had some wiggle room on estimated finish because it was off-road, but I finished it 12-14 minutes longer than anticipated. It is what it is, time to practice some trails. Stupid rocks. All said and done, even with a long T1 and crappy run, but the extra time cushion from the swim, I finished 2:44 under my estimated finish. And I wasn’t DFL. It was an incredible day. I wouldn’t trade it for the world–even the not-so-pleasant moments serve for learning. And I got to share it with my husband and was cheered on by several friends also racing. How could you go wrong? I cried out to Him, I have been obedient to Him spiritually, emotionally/mentally, and physically, and He has been faithful to me. I know my journey doesn’t make sense to some, and I’m at a place where I’m not going to constantly repeat myself. The part I’ve always said and will continue to say is that I’m here, let’s chat–because there’s so much more than meets the eye. The healthy habits that have contributed to achieving a healthier weight and continue to do so, racing/training, physical accomplishments, etc–all of them are a tiny part of a bigger picture of obedience to God’s will. I won’t be made to feel guilty about pursuing a deeper relationship with God that permeates into every fiber of my being in every single part of my life, ministry, thought, and action, or pursuing or sharing the interests that I have and not wearing the frustrations of my life and/or ministry and the minutiae and absolute insanity of each day on my shoulder like a badge of honor. Sure, I do share some struggles, because everyday isn’t sunshine and roses…but could it be I share some things over others as my escape from the stresses of life? Let’s put it this way…without an outlet, you probably wouldn’t want to know me right now. And I say that in all seriousness. But I have balance…I have lots of balls that I juggle professionally and personally and believe it or not, life is hard and we’ve navigated through some tough stuff the past few months, but God is faithful and things are coming around. I’m excited for the future in many way. Stay tuned, there’s more to come. My newest favorite four-letter word: tri shorts. As I dance that sweet line between 195 and 200 pounds down (200 more days than not, but we’re not calling it official yet until consistent for a certain period of time), I still find myself in that great wrestling match of figuring out my body. My body does so many amazing things that it has never done before, and yet I still get stuck on that teeter between how my head sees me and the person that I can see in front of my face that almost seems surreal today. It’s so hard to absorb reality. People often forget that not all my goals are physical. Just like what is publicly presented and what I share isn’t 100% of what I do professionally or personally, or what my priorities are, there are other things that are being worked on, focused on, and changing. One of the goals I have been working on through this journey of holistic wellness has been acceptance–attacking this very battle I speak of above, to come to a place where there isn’t a disconnect in how I perceive and view myself inside and out. To learn to accept myself just the way I am. I can’t begin to tell you the spiritual and emotional struggle this has been and I’m not going to hash out on this platform the highly personal work on what it’s taken me to start to make some progress in this area and the work that continues to still go on. But, per usual, let’s chat–I am happy to share my experience on a one-on-one level, because I know I’m not alone in this struggle. But, I will give you some glimpse into this–I’ve spoken before about how the loose skin on my body bothers me. Yes, vain, I know. I’ve also spoken how the loose skin on my upper arms pulls on my neck and shoulders and causes pain, and how the loose skin on my thighs pools on my thighs and around the top of my knees and can cause pressure on my legs. Those things I can get over, it’s part of life…compression capris cover a multitude of sin. In running. I’ve sucked it up and donned the cycling shorts for a year now, but staring down triathlon race day…there’s a whole other head game in play realizing I have to run in shorts. Now, God bless my coach, not even realizing my irrational feelings about shorts (realize, I have not owned shorts in my wardrobe in decades), has actually assigned my workouts recently to be in tri shorts (shorter inseam than my cycling-specific shorts) so that I am running in them to be used to them on race day–I’ve cycled in them plenty. I’ve done a few super short runs off the bike with them, but today I took them for a full 5k to see the comfort at that distance as that is the distance of the run for this upcoming weekend’s sprint tri. Do I like how I look here? No. Not even a little bit. I see every inch of the sagging skin that I despise. But here’s what I’ve also learned–I see a woman that had a strong effort this morning running up and down the dam and equestrian center coming within 1:40 of my 5k PR that was achieved on flat course. I see a woman that spent her morning communing with God, engaging with Him on so many issues close to her heart ranging from personal matters to professional matters and everything in between before doing anything else. I see a woman that is imperfect, has yet to figure out how to not conduct business on a day off, actually spent a few hours unpacking boxes today, and continues to be blown away daily by how awesome that God has been faithful because she has been faithful. The negative and the positive can coexist. Acceptance doesn’t mean I have to like what I see. It means that I take it for what it is. It’s not good, it’s not bad, it just is. I can’t go back and change the past. I don’t have a crystal ball to know God’s plan for the future. But I can live in the present. I can do my best, each and every day to be engaged with the Holy Spirit and to carry out God’s will for me. One imperfect step at a time. And I think that’s a pretty good goal. So, other than blasting my crazy excitement for finishing 26.2 miles across social media, I was (smartly) cautioned by my coach to not evaluate my race performance, make too many judgments, or even study the metric feedback for the first couple days–and he was zipping his lips too–until my body and head were back to a place of more or less equilibrium and could fully comprehend and absorb the information. First of all, can we take in the enormity of this first fact: 3 years ago I couldn’t walk to the end of the street and back without wanting to die. On Saturday, I ran 26.2 miles. And there’s the first point of acceptance for me that brings me back into check. I was warned over and over in training to not set myself up with numerical goals such as pace, total time, splits, etc for a first marathon. I did this in speech, but my numbers brain tried to do some math…I was shut down in discussion in training, but I don’t think it ever shut down in my head. I had some different numbers in my mind, specifically in terms of finishing time and pace over different technical sections–and because of so many factors (and that I’m a noob at the marathon distance), of course I miserably failed at them. But–I met the #1 goal: finish a marathon. Friday was probably not the best planned. It started early in the morning with business in our local office, traveling with my husband for business in our other office in our coordination and doing some business errands, and then driving to Las Vegas where we capitalized on a free hotel night we had. Probably should have just stayed and rested and had a good dinner, but instead I wanted to make the most of the time we had that evening and we went to a triathlon fellowship/learning event that went late into the evening (for me, who goes to bed early) and then we had a late dinner afterwards. Not smart. I slept okay, but not fabulous, and was up before the alarm giving myself plenty of time to get ready. I had some food that I had brought with us, but I did not plan ahead logically for breakfast to have quite enough substantial calories–that had some impact on performance at the outset I believe until my fuel during the race started to level out not only my hunger, but feeding my energy levels and such too. We drove out to the race venue and got there a touch earlier than expected, no problem. Kissed husband goodbye and he went off for breakfast and to do some other things and would be back in a few hours to spectate at the finish. And that’s when the fun began…weather turned on a dime. It was cool for the morning, the anticipated weather was 40 degrees at start and 60 degrees and sunny for the day…however, the ominous clouds had different plans. The temperature never rose above 40 degrees and it rained from mile 7 all the way to the finish line (and all the way on our drive home to Laughlin). I had really wanted in training to try to make a trip up to Lovell Canyon and run part of the course prior to the race, or at least drive it to get a taste of what it would be like so I could properly visualize it. I am so happy that my schedule never allowed for it to happen–I promise you, I would not have even started this race had that been the case. I had the course and elevation maps and was properly trained on hills, but it was no comparison to reality. Other than the torture of “the beast,” I am satisfied with the amount of hill training that I had, as we live in a very hilly place and I often have a decent amount of elevation prescribed in my runs. The wheels started to come off around mile 10. I started getting a blister (one blister being my only “war wound” of the day) and letting it get in my head that this was going to “end me” because it was still so early in the race. Now, rational me (that side is in there somewhere…) kicked in and realized all I needed to do was find a place to sit down where I could take my shoe off and just apply some RunGoo that I had in my tri-top pocket to that part of my foot to alleviate the worst of it. A couple miles later at an aid station I was able to sit on a wet cooler (it had already been raining a while at that point) and take care of it and I was fine. From there things were plodding along…slow, but plodding along. I was FREEZING and soaking wet. Remember that high of 60 degrees? The average race temperature along the course that day was 37 degrees. I was SO cold, and that contributed greatly to my significantly slower than anticipated pace. When I’m cold, my muscles seize up and my body just doesn’t want to move. You’d think running, you’d be warm…wrong-o! Between the weather and being soaked to the bone, there was no chance that I was warming up. I swore around mile 15 or so I was hallucinating when I saw my husband drive up, but no, it was real, and it was the greatest blessing of the day!!! He gave me some much needed encouragement and found some work gloves in his bag that I could wear to help at least try to warm up my hands. He kept driving forward and was waiting every mile or so for anything that I needed, and always a much needed cheerleading session. Even when the gloves he had given me were soaked through, he pulled a (clean) pair of wool socks out of his overnight bag that I wore on my hands for a few miles just to try and get warm. As I got closer to finish, I was able to chuck things in the car too like my headphones that had died, my handheld bottle since I had flasks on belt, etc, which made things easier too. I am so grateful for my husband. I hate that I wonder this, but if he didn’t show up and do everything he did for me that day, I have to question if I would have finished–or at least finished as strongly. And then came the finish line. I was sobbing before I even crossed it. It brings tears to my eyes still to think about that moment. Sure, it took my longer that I thought it “should,” the weather was miserable, and a boatload of other stuff…but it had come. I did it. I ran 26.2 miles. No one can take that away from me. I have spoken in conversation that I felt like my very first half marathon was my most memorable athletic achievement so far, and I think I still believe that. The completion of a marathon…it’s different. 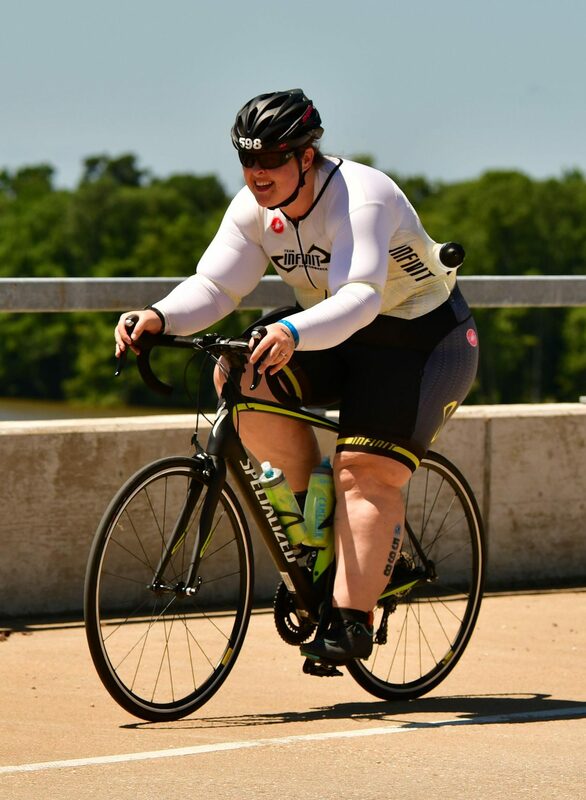 It was incredible, absolutely, I’ll never forget it–it was more emotional that I think I possibly even anticipated it to be at the end, but the meaning that it holds is a different kind of achievement–it’s one of learning and endurance, and proving to myself what is possible, what my body can take, and how much farther I can go. And will go. I don’t think I could possibly begin to list in detail all the many lessons that came from this experience. I learned technical things, the areas of mental and physical strength that are still weak, things about myself, and things about humanity (mainly stupid drivers on an open course, but also how incredible and encouraging other athletes can be to one another). I see why the marathon is a endurance feat all its own. And I can’t wait to look at those lessons and apply them to training for the next one. Because I can’t wait for the next one…how does six months sound? I’m coming for you Chicago!!! But, rest and recovery aren’t docile actions, because I’ve still got goals, and a sprint triathlon coming up in 38 days. I’m back on the bike tomorrow for some light workouts this week, aiming to hit open water swim this weekend, and we’ll see what next week brings once I get the full calendar for that. At the end of the day, and everything that went down to get to the finish line, the one thing I know for sure…I. Am. A. Marathoner. I can officially say this has been an awful week. Not a darn thing to do with running, just life hasn’t followed it’s pretty perfect plan. So, it’s been very frustrating. Then add on top of it modified workouts that aren’t my normal routine (quite light), but I’m ravenously hungry and eating more but not everything not nailed down–yet. I’m exhausted. I’m supposed to be getting more sleep, and I’m getting to bed on time, but I’ve been waking up at weird hours through the night and then having a hard time dragging myself out of bed, which it not my usual behavior. So, everything coupled together….I’m cranky, hungry, and tired. I’m also super excited and terrified at the same time. Race day plan is locked and loaded. I’m as ready as I’m going to get (oh, and no live tracking and notes from the race director say that cell service is spotty, so just don’t expect news until the end/as we head towards post race food in civilization if you follow my social media). At this point there’s nothing more I can do in order to get ready but show up on the start line and run my best. There’s three mantras that keep me going and come into play at different parts of the race. I’ve trained so I will know what my body will feel like at all points, I know what to expect and how to deal with the unexpected. Trust the Training- I’m not going to elaborate on this one now, there’s another blog post I’m dropping next week that hits this. Fortitudine Vincimus (By Endurance We Conquer)- pretty self explanatory, just keep moving forward. Don’t stop. Quitting is not an option. IWBMATTKYT- It’s an acronym from The Sufferfest…no, I’m not spelling it out to keep it family-friendly, but this one has come to reignite the fire for me at just those right moments when my head and body are at odds with one another. Think 40% rule. At the end of the day, this holistic journey is for the glory of God…but there’s some of my naysayers that could be clicked down a notch too. Okay, time to get back to work and shut off this side of my brain again for the moment. It’s a good thing. I can do this. I will do this. I’ll see you at the finish line.